WATERLOO – Food justice advocate and musician Anan Lololi will be speaking at Wilfrid Laurier University’s Waterloo campus during the Spring Food Forum April 7. Lololi’s talk on on urban agriculture takes place from 1 p.m. to 4 p.m. in the concourse. The forum, presented by Laurier’s Sustainability Office and Young City Growers (YCG) – a grassroots initiative focused on creating urban agriculture – will challenge students to think about issues such as local food systems, sustainable farming, food security and sovereignty, and environmental stewardship. Students will also have an opportunity to register and learn about the local Community Supported Agriculture (CSA) program, a weekly delivery of farm fresh produce. Lololi is one of the founders and the executive director of the Afri-Can FoodBasket (AFB), a non-profit food justice and community food security organization that began in 1995 in Toronto. Lololi holds a master’s degree in Environmental Studies from York University and a diploma in Business Administration from Centennial College. Lololi has served as an executive member of the Growing Food and Justice for All Initiative (GFJI) based in Milwaukee and the Community Food Security Coalition of North America. He has been a board member of the Toronto Food Policy Council and Food Secure Canada, an administrative and food policy consultant for the Detroit Black Community Food Security Network, a committee member of Toronto and Region Conservation Authority (TRCA) Humber Watershed Alliance, and was a food policy and urban agriculture consultant for FoodShare Toronto. Lololi had also been appointed to the Sustain Ontario Advisory Council. 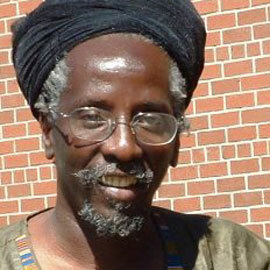 He has lectured across Canada, the U.S. and in the Caribbean on community food security and food justice. To register for the CSA, contact Fanis Juma Radstake, program manager at Young City Growers, at youngcitygrowers@gmail.com.